Automotive cockpit electronic products enhance the travelling experience and convenience by offering better driving control, safety and entertainment. Automotive cockpit electronics are considered as an important part of modern automotive. Diversified market of modern automotive cockpit electronics is gaining traction among consumers on the account of the better efficiency, high quality and integration of cockpit connected devices with smart devices. Global automotive cockpit electronics market was valued at USD 33.9 Billion in 2016. Further, the market is expected to expand at a CAGR of 8.7% over the forecast period. Rising trend of integration of smart devices with automotive is expected to foster the growth of global automotive cockpit electronics market. Further, the increasing demand for better user experience and convenience features is anticipated to drive the market of global automotive cockpit electronics market over the forecast period. Furthermore, North America is expected to be trailed by Europe and Asia-Pacific. Europe is expected to maintain second position over the forecast period. 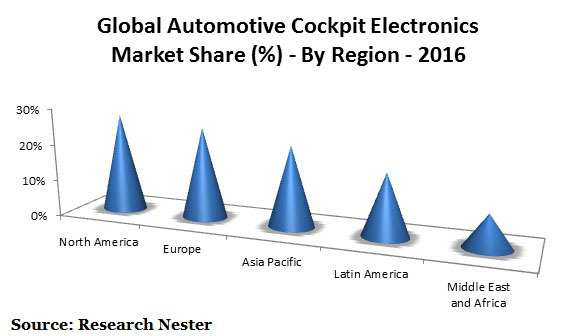 Factors such as presence of major automotive companies and increasing disposable income are expected to propel the growth of automotive cockpit electronics market in the Europe region. Asia Pacific is anticipated to grow at highest pace over the forecast period on the account of the increasing middle class population and rising disposable income. Moreover, the expansion of automotive industry is expected to bolster the growth of automotive cockpit market within the region over the forecast period. China, India, South Korea and Japan are the major countries witnessing the augmented demand for automotive cockpit electronic products. Increasing disposable income and rising sale of automotive across the globe are the major factors driving the growth of global automotive cockpit market. Moreover, inclination of consumer toward enhanced driving experience and increasing concern about the safety is predicted to trigger the growth of the global automotive cockpit electronics market. Further, stringent government regulations about the safety of passenger are envisioned to bolster the growth of automotive cockpit electronics market. Further, the implementation of passenger safety regulations is boosting the market of various advanced automotive cockpit electronics products such as anti-lock braking system, advanced driver assistance system, electronic stability control and others. Apart from this, technological advancements associated with automotive cockpit electronic such as adaptive lighting technology are one of the key factors fuelling the demand for automotive cockpit electronic products. Moreover, increasing demand for inf0-travelling on the account of increasing tourism activities is expected to augment the growth of global automotive cockpit electronics market. However, high cost of technologically advanced cockpit electronics product is projected to dampen the growth of global automotive cockpit electronics market. Moreover, high price of repair and maintenance of technologically advanced cockpit electronics is anticipated to hinder the growth of the automotive cockpit electronics market.